We have been engaged in research using Japanese sources to discover the nature of ancient Japanese worldviews and practices dealing with nature and the universe. We found striking the prevailing attitude of honor and reverence for the forces of nature in general and mountains in particular. This is not surprising since the Japanese archipelago has a limited landmass which is mostly mountainous and the sea is nowhere distant. Although we are not directly interested in the Shugendo mountain practices of the yamabushi we feel that they no doubt can tell us a lot about earlier worldviews. In the course of its history, Shugendo has evolved from what we might call proto-Shinto to include many elements of religious Taoism and a great deal of esoteric Buddhism. Before we begin, we point out that early populations held mountains to be the abode of kami, deities, and so the people did not live in the mountains but rather at the foot of them. We have found this to be an ancient Hawaiian practice as well. Shugendo began in prehistory. Many activities were associated with sacred mountains, such as agricultural ceremonies at the foot of sacred mountains, not on the mountains themselves. After the 6th to 7th centuries, elements of Buddhism and Taosim were incorporated, such as pilgrimage and retreat in the mountains and rituals on mountain tops. It is said that En no Ozunu in the 7th century was the first to do so. Sangaku shinko is the term used for mountain beliefs, and includes all the aspects in which mountains play an integral role in religious activity. Japanese scholars have devoted their attention to sangaku shinko. Archaeologists have found at many sites various sacred uncut boulders called iwakura, ‘seat of kami.” The academic, Ooba Iwao in the 1940s has published on this topic. Mountains have a sacred character as dwelling places of kami, as burial sites of important leaders, and as sacred sites of great beauty. They are always found in creation stories, in ritual sites, and in genealogy of gods and men. Sangaku shinko is earliest datable to agricultural rituals held at the foot of mountains. Even earlier rituals which have left no artifacts are possible, such as those of hunting and gathering. Ooba concludes that the earliest shrine sites were at the foot of mountains. Although modern day priests say that their shrine was originally founded on a mountain top, we would not agree. The shrine buildings on mountains came much later. The mountain itself was held so sacred that no ancient practitioner would have constructed a permanent shrine there. Mountain shrines called yama-miya were not originally shrine buildings but rather holy places around mountains visited by shrine priests. See, e.g., Yanagita Kunio who reports that priests of Ise visited yama-miya in spring and fall and erected temporary shrine altars. Yanagita (1947) states that earliest shrines were natural formations such as trees and waterfalls. Prior to organized shrine worship, there were indeed holy places or ritual sites called yama-miya within the mountains. Activities included rituals for descent of kami from mountains, offerings to kami in the valleys, and veneration of clan ancestors. We must remember that kami are considered ancestors of clans. Mountains are sacred because they are sacred in their own right, they are places where kami dwell, they are the revered other land of spirits of the dead, and are sites for rituals honoring kami and the dead. Yanagita differentiates two classes of yama no kami, mountain kami. One group are agricultural kami which take on two forms, mountain kami and field kami depending on the season of the year. These practices developed into the obon festival of the dead and also into fertility rituals. The other group are the mountain kami of men who worked in the mountains such as hunters of game and woodcutters. Hori Ichiro (1951) found that the yama no kami of both types were almost always female. They had twelve offspring that represented twelve months of the year. The twelfth day of the month was sacred to these kami. These believers did not enter the mountains on the twelfth day of the twelfth month. This entry was posted in Ancient civilization, Mountains and tagged Shugendo on 2013/12/25 by Okunomichi. 7. Isanagi (Kunisatsuchi Ta-no-mikoto’s fourth generation descendant). Married Isanami, daughter of Toyoke (Ta bloodline). His son became Kanyamato Ihawarehiko, known as Jimmu Tenno. This entry was posted in Hotsuma and tagged Amakami on 2013/12/18 by Okunomichi. 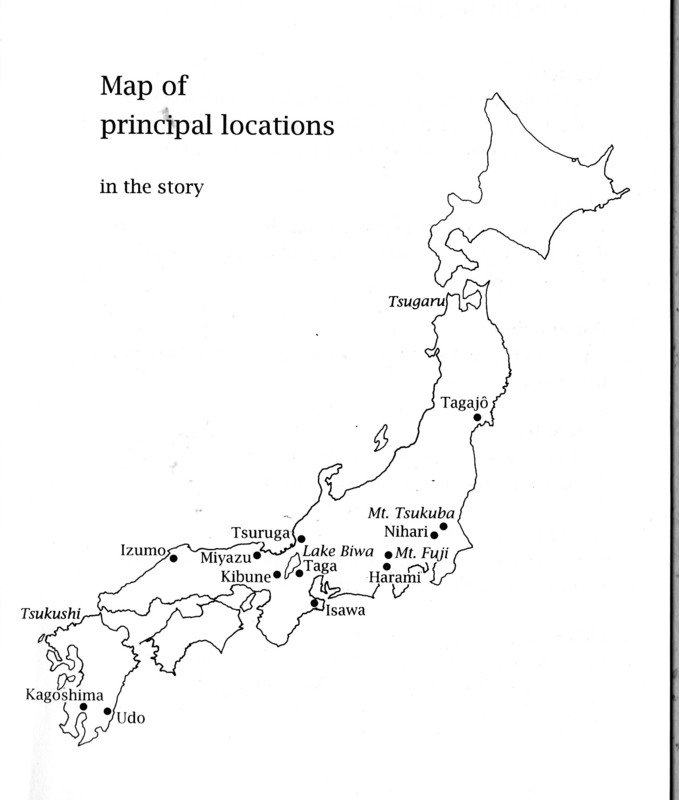 The map shown is from The World of Hotsuma Legends, by Mitsuru Ikeda, 1996. We briefly describe the significance of the places shown on the map. Tagajo. Tagajo is a city near Sendai. It was the home of Lord Toyoke, the Fifth Takamimusubi, ruler of Hitakami (now Tohoku). His palace was there, and he taught his grandson Amateru the Way of Hotsuma before Amateru assumed his position as the 8th Amakami. Nihari. Near Tsukuba. Isanami and Isanagi spent their early married life in Nihari. Amateru sent Ninikine to open up land for agriculture. Ninikine had a palace in Tsukuba when he governed the land around three thousand years ago. He created rice paddies in Harami and moved his palace there. Harami. Southern foothills of Mt. Fuji. Harami was the home of the second Amakami To no Kunisatsuchi, six generations before Amateru built his own palace there. Isanami and Isanagi had a palace near Harami and Amateru was born there. Ninikine, 10th Amakami, also built a palace two generations after Amateru. Tsuruga. Palace in Kita-no-Tsu from which Ninikine’s sons, Sakuragi (Honosusumi) and Utsukine (Hohodemi), governmed the Land of Ne. Hohodemi became Amakami. He was buried at the palace of Isasawake in Tsuruga and became the deity of Keyi. Taga in Omi. Now in Shiga-ken, Taga was once the home of Kunitokotachi as well as Isanami and Isanagi, also Honoko, wife of Amateru, and Wakahime the sister of Amateru. It is 10 miles into the mountains of Lake Biwa. Oshihomimi, 9th Amakami, held court there, as did Ugayafuki Awasezu (from Mizuho). Taga Taisha in Shiga is an offshoot of Taga Jinja in Tagajo. Isawa. South of Harami, Amateru built a new capital. It was home to his grandson Ninikine as well when Amateru lived there. Miyazu. In Tamba no Kuni, the northwest near Ama-no-hashitate. Toyoke quelled a disturbance there at Amateru’s request. He built a palace and ruled until he died there at Manai. Toyoke’s tomb is on Mt. Kujigatake, behind the Hinumanai Jinja. Amateru lived in Miyazu for ten years following the death of his grandfather to provide solace for the grieving populace. Kibune. Now known as the home of Kifune Jinja in the valley adjacent to Kurama yama. Ninikine built a palace in honor of the water goddess Mizuhanome to prevent floods and improve irrigation. He honored the deity of fire at Atago jinja to prevent calamities caused by lightening. Since he divided (wake) thunder (ikatsuhi), people called him Wake-Ikatsuchi. Where he lived, Kamigamo, came to be known as the heavenly house of Wake-Ikatsuhi, Waketsuchi Shrine. It is now known as Kamigamo Jinja. Mt. Waketsuchi is now called Mt. Kibune. Izumo. Sosanowo conquered the Land of Izumo. He built the Kitsuki, or Yaegaki, Palace which is now Izumo Taisha. Kagoshima and Udo. Lord Hadekami/Hadezumi lived at the foot of Mt. Kirishima. After Hohodemi arrived in Udo, he received assistance from the lord in finding his brother’s lost fishhook. Hohodemi became Lord of Tsukushi/Kyushu. The Kagoshima palace of Hohodemi, 12th Amakami, and Toyotama was on the northern edge of Kagoshima Bay. This entry was posted in Hotsuma and tagged Hotsuma Tsutae on 2013/12/18 by Okunomichi. This is the very moving story of the death of the brave Prince Yamatotake recorded in the final aya 40 of Hotsuma Tsutae and rendered at http://hotsuma.gr.jp/index-e.html by the Japan Translation Center. Yamatotake is the hero known to most as Yamato Takeru. He was the son of Keiko Tenno. His main shrine is Atsuta Jingu in Nagoya. See atsutajingu.or.jp. We recently visited the impressive Atsuta Jingu in Aichi-ken. According to the jingu site, it enshrines: Atsuta-no-Ookami, Yamatotakeru-no-Mikoto, Amaterasu Oomikami, Susanoo-no-Mikoto, Miyasuhime-no Mikoto, and Takeinadane-no-Mikoto. We wondered why this main shrine of Yamatotake is here, although he is enshrined elsewhere, e.g. at Towada Jinja in Aomori (see our previous post). In other words, what is the connection among Yamatotake, Atsuta, and Aichi? Indeed, why is the fabled Kusanagi sword kept here? The Hotsuma website gives the answers. The Kusanagi was kept by Yamatotake’s wife, Miyasuhime, at her side at Owari while she awaited his return from his final campaign. Note that aya 40 is the last of the Hotsuma Tsutae ayas. Princess Miyasu’s father was the headman of Owari, Owari-no-kuni-no-miyatsuko, whose extensive land is now in Aichi-ken near Nagoya. We noticed several train stations containing the name, Owari. Now, who is Atsuta-no-Ookami? The story of Prince Yamatotake explains. The prince served his father the sovereign in many campaigns to maintain order in the land of Hotsuma. His father was Woshirowake whom we know as Keiko Tenno. The prince’s birth name was Hanahiko, and he was the heir and beloved son of his father. Hotsuma calls him Yamatotake, the brave (take) of Yamato. Just before his final campaign, the prince had resolved to build a palace for him and his wife at Owari. His father-in-law went to Woshirowake and asked for permission to build a palace like his. This palace, built posthumously, is now the Atsuta Jingu. Why Atsuta? The shrine’s web page states that “Atsuta-no-Ookami is Amaterasu-Oomikami as represented by the sacred sword Kusanagi-no-tsurugi.” This sword is one of Amaterasu’s three sacred treasures, the others being the mirror and the jewel. And the shrine seems to differentiate between Atsuta Kami and Yamatotake(ru). By the way, the tsurugi Kusunagi is the very same Murakumo used by Susanowo in his battle with the Orochi. Yamatotake’s body having been brought to Owari by retainers, Woshirowake, deep in grief, conducted the funeral rites. When a white bird flew into the sky, the coffin was opened and there only remained the prince’s headdress, his mace and his garments. Four white feathers fell on the Plain of Kotohiki in the Land of Yamato, and four others on Furuichi in Kawachi. At these two places, funeral mounds were raised. The bird flew up into the heavens and its scattered tail fathers seemed like shide (paper strips) that purified the ills of the world. After that, Woshirowake gave permission for the new palace to be built at Aichida. Three years after the demise of Yamatotake, the prince was deified at the Ohoma Great Hall at Aichida which is now the Atsuta Jingu. Yamatotake declared that he was an embodiment of Susanowo who redeemed his bad deeds and became a deity. Thus it is that Yamatotake became the deity Atsuta and is enshrined at Atsuta Jingu. And it is thus that Woshirowake commanded one of his ministers to compose additions to the existing Hotsuma Tsutae, thus extending the document to 40 ayas. The word “tsutae” in Hotsuma Tsutae means a document that imparts or bequeaths knowledge and wisdom for later generations. Such was the aim of Jimmu Tenno who asked his Minister of the Right, Kushimikatama, to create it. The task was brilliantly executed in 28 chapters written in the poetic rhythm of 5 and 7 syllables, the rhythm of Heaven and Earth. Seven generations later, in the first century of the Common Era, 12 more chapters were added by one Ohotataneko for Keiko Tenno. Thus the 40-chapter document was completed. This entry was posted in Hotsuma, Jinja and tagged Atsuta, Yamatotake on 2013/12/18 by Okunomichi.